On May 28th YPEM members gathered at the new Central Wharf Co. for the “Back 9” After Party. 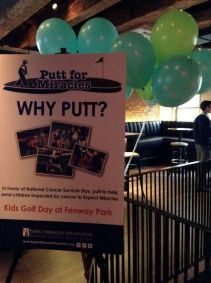 Attendees celebrated the start of the “Putt for Miracles” campaign, benefitting Kids Golf Day at Fenway Park for children impacted by cancer and their families. The highlight of the event was the putting green in the middle of the bar! Attendees were able to putt to win pizza from Ernesto’s Pizza, and all contestants were entered to win a VIP Red Sox experience. Courtesy of Central Wharf Co. and Narragansett Brewing Company, guests enjoyed complimentary appetizers and beers while learning how to contribute to Expect Miracles Foundation. The Young Professionals were given the opportunity to network, socialize, and learn how to make a difference in the fight against cancer. Toward the end of the evening, attendees were shown a video about Kids Golf Day and its impact on children and families impacted by the disease. YPEM President Charles Goodman gave a speech expressing his gratitude and excitement about the future of the organization. We hope to see everyone at the next YPEM event!